Ok, so I was reading this blog one day (How Sweet it is) and I stumbled upon something truly life-changing. I’m sort of obsessed with goat cheese. Yes, I know, the thought of goats standing and staring at me is truly freaky. But, once I got over that, I decided to try some. In the midst of creepy visual goat images, I found true bliss. Goat cheese is creamy, delightful, and wonderful. It is, in fact, the mother of cheeses. So, what would be better than crunchy covered goat cheese? Nothing! So, as soon as I saw this, I had to make it. And…I also put some salad with it, to make me feel better about eating balls of cheese coated in bread. But, but it all together in a salad and AHHHH!! One of the new eight wonders of the world. The great thing about these recipes is….you don’t need an actual recipe! You can gestimate the amounts, which makes me so happy! I kind of get ticked off with numbers some times, so these recipes are for you, if you share my annoyance! There they are, right before they become covered in oilly goodness. But, I bet you are wondering how I make them? Well, lucky for you…I’m going to tell you. Six ingredients to instant bliss. Plus, you don’t even need to measure! 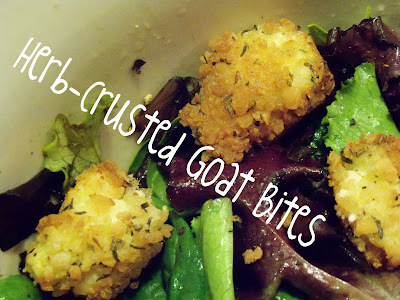 Roll the goat cheese into balls, or disks, or logs. Heat small skillet on medium-high heat, add a few tablespoons of canola oil. Saute for about 1-2 minutes on each side until golden brown. Drain on paper towels, and add to this fabu-lash salad that I’m about to show you. First, carmelize the onions. This is done pretty simply by taking some onions in a small pan with some olive oil and frying them on medium-high until golden brown. These are ammmmmmaaaazzzingggg! Cover with the sliced apples, onion slices, and goat cheese bites. Eat your way to honey heaven!!! Oh my gosh, I can’t even take it any more! These are sooooo GOOOOD! Oh no, I was GOING to take a picture of this….but…it was so good. What? I’m sorry…not really.